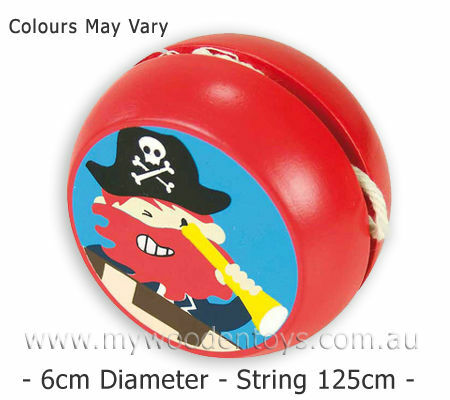 Wooden Pirate Yoyo is a solid wooden Yo-yo with a 6cm diameter and a 125cm long string. This Yo-yo is decorated with an eye patch grabbing pirate theme. This Yo-yo has a nice smooth action and is well weighted. Yoyos are great for fine motor skills and co-ordination and are also just plain fun. This Yoyo has a nice soft cotton string. Size: 6cm diameter 125cm long string. Material: Cotton string, Wood with Child-safe paint. We like this because: It is a Yoyo all ready for the 7 seas. Arghhhhh me hearties!"